The patch intended only for WDDM 1.1 OS (Windows 7) and works for PhysX GPU only (not PPU). But this is not important because PhysX PPU (the Ageia card) support will be removed in PhysX 2.8.3 SDK (NVIDIA, where is your pay back department???). 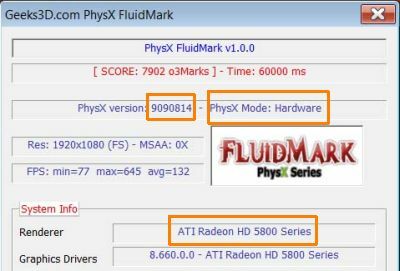 Ohh I didn’t see that I removed the PhysX hardware or software mode indication in the last FluidMark. I’ll release an update soon with this important field! what is your phsyx renderer? 8800gt? 9800gt? i always get minium 2fps why? Hello! THANK YOU GUYS!!!!!!!! 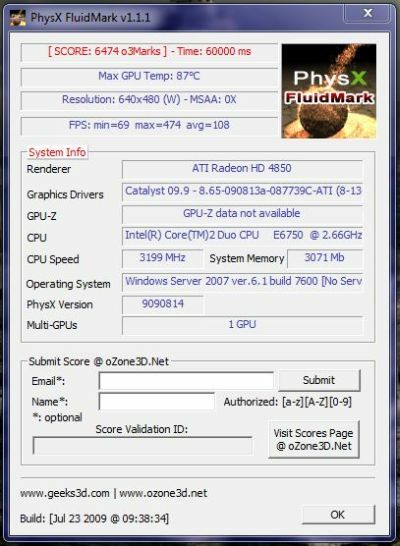 I have tried this one with my 4870+8800 gt and now I have hardware PhysX ON. Batman flies like a rocket (with PhysX on)!!!! :):):):), before that I had about 5 fps. I’m HAPPY! My hardware firewall make a content scanning and say that the downloads are with virus ? is it true have yours no problems or dont scan anything other files ? I’ve downloaded both of them and everything seems to be just fine and works fine :). Thanks to this patch I’ve manged to run ATI 4870 and nVidia 8800 gt. WOW!!! I must be reeeeaaaalllllyyyyy stooopid! I don’t get it… you guys are running an nVidia graphics card AND a Radeon graphics card in the same PC?…together?…at the same time? What is that, CrosSLIfire? Virus found in the patch executable. my virus scanner says there’s a trojan in the x64 exe. plz fix it.